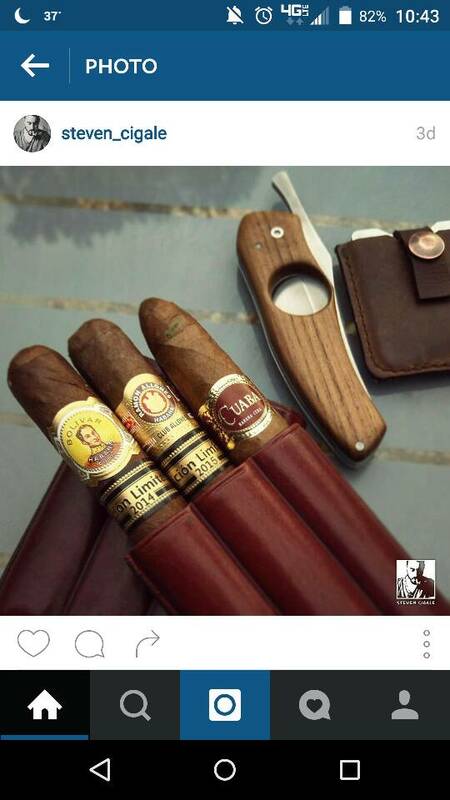 Some French guy messaged me on Instagram and said I took his friction folder cigar cutter design and copied it. I've never seen or heard of him or his knife. 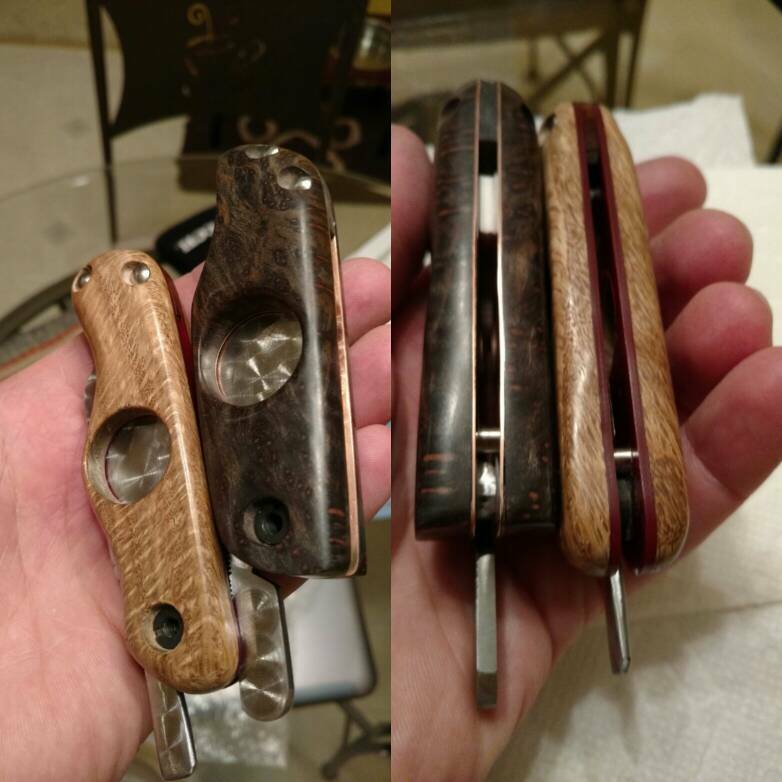 My design came from someone asking me if I could make a cigar cutter, I said no, but I could just drill a big gosh darn hole in the handle. And that's it. No real brain surgery here. Claims it's a registered design in France and the US. I looked after he accused me. But they both do, obviously, have a hole in the handle. It is nice, simple, clean. I just did a goggle and there must be 30 or more knives that have BIG hole in the handles for cigar cutting. It amazes me that guys think they have invented something new when in fact it is very rare that it's not just a variation of something old. as far as the patent biz, that is really hard to do and keep in force. Even harder when you start talking between country's. Thanks Erik. I was pi##%d and a little worried all at once. I don't want to copy someone. But I just took my normal design a drilled a damn hole in it. Super fancy right? Oh well. I've never been accused of taking the high road, tell him to piss up a rope! Hey guys, this site has a ZERO profanity rule. Please edit your posts and remember this rule in future posts. Thanks in advance for your cooperation. I wouldn't sweat it if I was you. When you have thousands upon thousands of makers making thousands upon thousands of knives, which in and of themselves can really only have so many variations, you're bound to see a similar idea pop up from time to time. As king Solomon put it, there's nothing new under the sun. Concerning "registered designs", what ever that may actually mean, it's POSSIBLE that he trademarked his design or design feature. Both Busse and Spyderco both have "hole specific" trademarks which can be used to ultimately prevent a maker from drilling a hole or holes in a specific place on a knife. Trademarks are kind of a funny thing... you have have a feature or term that tens of thousands of people have used for years and years, but the moment somebody decides they like it enough to pay a few dollars for a trademark on it, then it all of the sudden becomes theirs, and they can take legal action against others who try to use it as well. Of course, things get a little more complicated when it becomes "international", and even within the same country there can be questions on just how defend-able a trademark will remain. In this particular case, I probably wouldn't get to worried about it. "pi## up a rope" suggestion. "pi$$ up a rope" suggestion. Coach you might want to take a look at these posts, I am not telling you what to do but a moderator has and you continue to do it. You are about to banned!!!!!!! I thought I made it clear about the profanity. I guess I was wrong. Andrew is is spot on. 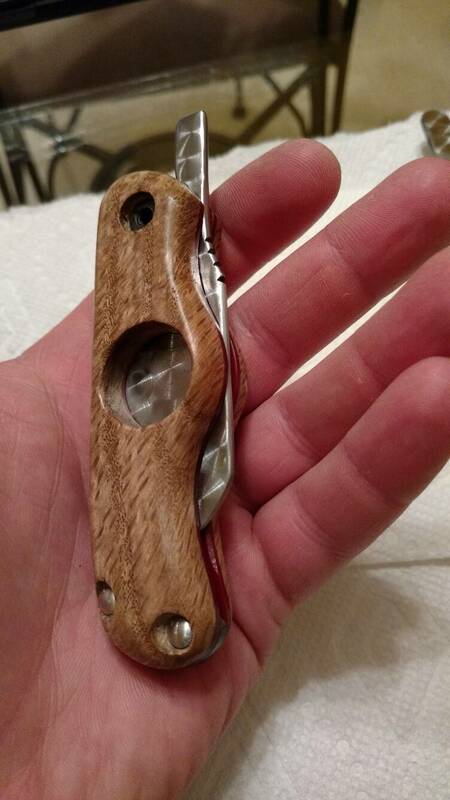 I've had knife designs and design features I've been tinkering with for years and have seen my ideas on different knives and I don't browse other people's work and usually I see them randomly from people I've never heard of. I've also been accused of copying someone famous by this person's fanclub and was even confronted by him publicly. 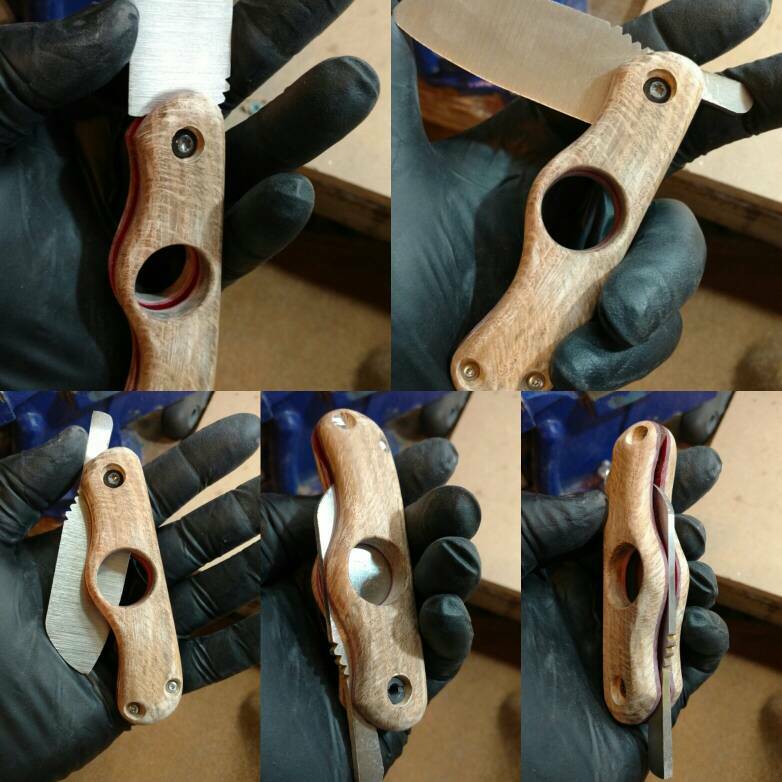 Not a fun experience but I still make said knife in question and sell it publicly because I didn't copy him and I'm not letting anyone tell me that someone owns any part of my design even if we may share one common feature. I've learned that in this business there are a lot of people with talent and a lot of egos. Some people are able manage both very well and some are not. You want to stay away from the people with egos that are out of control because they can't take criticism but will give it in the worst ways to people that are threatening to them. If you know you didn't copy this guy then who cares. As someone told me when I had my situation. "He doesn't matter. Block him and move on." Design features inevitably reappear on different people's work and it doesn't necessarily mean one is a copy of the other. If he is so insecure of his work or paranoid about losing business even though he may be a good craftsman with a good idea then he clearly has some issues only a trained professional can help him with. He should be using his time to sell a product with his name and skill instead of trying to push a competitor into accepting his claim over a design feature. Trust me if your blade looked terrible he wouldn't be threatened by you and wouldn't have contacted you. Thanks J. Glad I'm not the only one being harassed. Good Job Darrin - You are doing a good job, but glad I don't have your job.